Is this considered double spend? I was confident that it was ok since I saw 5 confirmation before I close the wallet. The next day when I checked I saw a sent transaction with 0.185 btc which I didn't authorized. When I click the link it showed me this Sent transaction. The weird part is it says that the output is 1btc which I didn't have because I only have 0.185 btc on that wallet. This wasn't a double spend, I'm sorry to say, but it looks like your bitcoin was stolen. The reason the transaction out says '1 BTC' is that your bitcoin was combined with bitcoin from a bunch of other addresses, and sent all together to that new address. You'll have to carefully think about how this might have happened. If your wallet was backed up by email, it may simply be that your email account was compromised. Not the answer you're looking for? Browse other questions tagged blockchain.info doublespend or ask your own question. 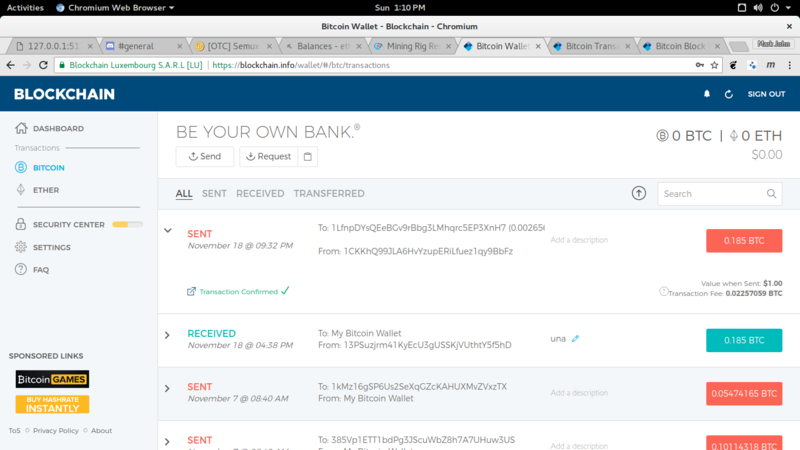 I bought 1BTC and the transaction was instantaneously, how? Can I double spend this transaction?